If I remember correctly, this was made for the son or nephew of a coworker who - apparently, liked to ride his bike. Unfortunately I don't have much in the way of notes for this one - just the date, the kid's name, and "Bike wheel. chocolate & chocolate." 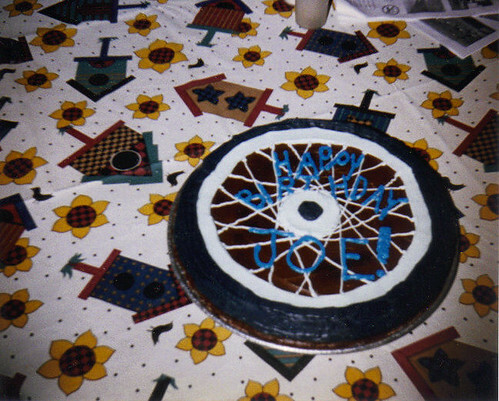 In looking it it, I probably used royal icing for all the detail work, and I also didn't have an actual bicycle to look at, otherwise perhaps I'd have done a more accurate job with the mechanics of the thing.